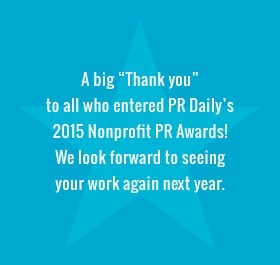 Congratulations to the winners in PR Daily’s 2015 Nonprofit PR Awards! Now we present the list. The list of the best work done in PR that made the world a better place. The entries came in from around the globe, stories of success from nonprofit organizations, from the agencies that represent them and from individual PR specialists. Our judges saw stories about measles, teen safe driving, hidden heroes and much more. We thank each and every entrant in this year’s program. Once again you’ve shown us why you lead the way in public relations. You make this program a success. And now…the winners of the 2015 Nonprofit PR Awards!